I interviewed my friend, Damilola for the blog. I’ve known Damilola from secondary school. We discussed books, reading and accessing books in Nigeria. I like to believe I learnt to read pretty fast. As a child, I read mostly storybooks with the popular children’s fairytales like The Princess and The Pea and Cinderella. The primary school I attended used to give us storybooks as birthday presents. Through my adolescence, I wasn’t much of a reader as most of my classmates were, but when I started doing literature in high school, I began to really like reading fiction mostly because of all the places I could go to through different books, and even then I was very picky. One of the first books I remember really enjoying was To Kill a Mockingbird by Harper Lee. What were favourite books as a child? As a child, I had this collection of books with some of the Grimm’s fairytales and a bunch of other children tales which I loved so much because there were many books in it. I can’t pick a favourite there. I don’t remember what I spent my childhood doing but I don’t think I read a lot. Do you have a favourite genre of literature? I do have a favourite genre of literature. Prose over all! To be more specific, I really like historical fiction. I read a few historical fiction books last year and I really enjoyed them. *If you love Historical Fiction, you would like Homegoing by Yaa Gyasi and The Book of Harlan by Bernice McFadden, I wrote briefly about The Book of Harlan in this post. How do you balance reading alongside other interests? For example, I like podcasts and sometimes it’s a struggle for me to decide whether to spend my time listening to a podcast or to a pick up a book instead. Hmm. Balancing reading with other interests can be tricky sometimes. I love music, and I’ve found that reading while listening to music is not a bad idea. Especially, relaxed or wordless music. I find it hard sometimes to read while I’m commuting because I like to just look at the road, the other vehicles, the billboards and people walking on the street. Generally I just like to be aware when I’m in a moving vehicle. So sometimes it’s hard to make a decision between people-watching and picking a book from my bag to read. But when I’m at home or by myself, I’m usually drawn to read something. Which authors stand out to you? There are a lot of authors I’d like to read more from particularly because of the topics/issues they portray. I’d read anything by Chimamanda N Adichie, Marlon James, Taiye Selasi, Sefi Atta and many others I can’t remember right now. I’d definitely read anything they write or listen to any speeches they give. What books would you recommend to people who are new to reading or want to read more but don’t know where to start? The books I’d recommend are based on my taste and books I’ve really loved. One book I’ll always recommend is Things Fall Apart by Chinua Achebe. It’s one of the most widely acclaimed books by an African writer, and for very good reason. If you’re not really into African Literature, Gillian Flynn has brilliant thrillers and Jodi Picoult is also very good. You should read Dark Places. I’m trying to read more non-fiction this year. One non-fiction book I would recommend is Freakonomics by Stephen J Dubner and Steven D Levitt. It’s one book that has really opened my mind to a different way of thinking and of viewing human behavior and incentives. *If you’re looking to read more non-fiction, I recommended some in this post. Has living in Lagos affected your ability to access books you are interested in? Because I’m a lot more interested in African Literature and writers, it hasn’t really been difficult finding the books I want to read in Lagos. Publishers like Kachifo and Cassava Republic are here in Nigeria and they have taken on the job of publishing the works of talented writers from across Africa. Also there are a few, but still well-stocked bookshops in Lagos that sell ‘African fiction’. Even when I can’t find a book I want, there’s such a large community of readers and writers in Lagos that there’d definitely be someone who can lend or barter a book with you. Do you read e-books? Do you feel reading e-books in Nigeria would provide more people with access to reading books in Nigeria? Yes I read e-books. I’m hardly against it, but I also really love the smell and feel of physical books. I feel publishing e-books will give a lot of people access and exposure, especially to books from countries or writers who aren’t as popular over here. There are a few sites that sell e-books and many people download books using torrents. What books do you hope to read in the near future? Towards the end of last year, I made a list of books I was looking forward to reading as soon as I can get my hands on them. There’ll be more through the course of the year but here is my list for now. I run a blog with a very good friend, Aramide. On the blog, you’ll find a few book reviews and stories about our personal lives as millennials living in West Africa. I’m also on twitter! This entry was posted in Uncategorized on January 22, 2017 by Tunrayo. This year has been my year of understanding more about the black British community. I moved to England six years ago and I feel knowing more about the people in my community is important. Evelyn Dove’s biography was one of the books I read this year that helped me learn more about the black community in Britain. You may be wondering who Evelyn Dove is. She was the first black female singer on BBC radio and the first black British female singer to work in America. Here’s the blurb about her biography, Evelyn Dove: Britain’s Black Cabaret Queen. A pioneer and a trailblazer, Evelyn Dove left a mark in the arts industry. She was the first black female singer on BBC Radio and the first black British female singer to work in America, a quarter of a century before Shirley Bassey. In a career lasting five decades, from the 1920s to the 1960s, Evelyn Dove embraced the worlds of jazz, musical theatre and cabaret. Refusing to be constrained by her race or middle-class West African and English backgrounds, she thrilled audiences around the world, courted admirers and fans wherever she performed and scandalized her family by appearing on stage semi-naked. Her mesmerising movie star looks and grace captivated those in her presence, yet her extraordinary career was one of many highs and lows. Evelyn Dove – Britain’s Black Cabaret Queen is illustrated with over fifty rare and unpublished photographs from Evelyn’s private collection, now in the possession of the author. I feel this book is necessary because it’s helped me understand the diversity of the black British experience. My grandmother was a Nigerian nurse in the England in the 1960s and I would hear stories from her perspective but reading this helped understand others who worked in other professions like the arts. What did I learn about black British history from Evelyn Dove – Britain’s Black Cabaret Queen? Black British history did not begin when the Empire Windrush arrived in England in 1948. I knew quite a bit about the migration from the West Indies and Africa in the 1940s to 1960s but I didn’t know much about earlier migration before this period. Evelyn’s father, Frank Dove was a man of West African heritage, born in Sierra Leone. He trained as a lawyer in England in the late 1800s. Stephen Bourne describes Evelyn’s father and other Africans who had a similar experience to him as middle class West Africans who were more at home in England than in their home countries. Frank Dove married an English woman, Augusta Winchester. Frank and Augusta were Evelyn’s parents. Their marriage was interracial but was not illegal. I wondered if their marriage was accepted in English society. Leading roles for black actresses on British television in the 1950s were almost non-existent. Directors would not cast Evelyn as a middle class English woman, even though she could act the part. Times have changed now and black actresses can apply for mainstream roles. However, there is a lot of discussion on the under-representation of black and minority communities in the creative industries. That was why I was happy when I was able to support the Black Ballad crowd fund which is a media platform tailored to the black British female audience. I didn’t just want to talk about the under-representation of black people in the media but I wanted to do something about it. It was difficult for black people in Britain in Evelyn’s time to run arts organisations to represent their work. One of the organisations in the biography, the Edric Connor Agency was set up to represent actors, artists and writers of colour but struggled to convince casting directors that black actors could act. Our pioneers faced challenges and black arts and media organisations continue to face their unique challenges in the 21st century. I’ll give the example of Black Ballad. Their major challenge was funding and having to depend on advertisers for revenue. They have now created a membership platform where you pay to subscribe to their content. Evelyn Dove faced her challenges working in the arts and left a mark in the industry. I would recommend reading her biography if you are interested in black British history. Plus, it has pretty pictures from Evelyn’s life in it. *Evelyn Dove: Britain’s Black Cabaret Queen was sent to me from Jacaranda Books. This entry was posted in Black British Literature, Books, Uncategorized on December 27, 2016 by Tunrayo. I created a mental list of the books I wanted to get at the end of the year. But because, it was a list in my head, I would add new titles each time. This was making it difficult for me to decide what books to get. Also, it wasn’t going to be good for my bank account. Writing the list on the blog should help with my book shopping at Christmas and help me not go overboard with my spending on books. (Click the book titles to read the blurbs of each book on my wish list on Goodreads). Not Working by Lisa Owens is a novel I first heard about on Emma Gannon’s podcast Ctrl Alt Delete. It’s a book about a young lady who quits her job to find her purpose. I am interested in this as I’ve always thought about the idea of work and our career interests. I’ve heard the book is really funny and it’s been compared to Bridget Jones so I’m looking forward to reading this. Homegoing by Yaa Gyasi was one of the most talked about books by an author of African descent in 2016. I read blog reviews about Homegoing, listened to a podcast on Homegoing and watched a YouTube review of Homegoing. I also came across a twitter chat about the novel too. Having heard so much about the novel, I want to read it for myself. Darkowaa from African Book Addict recommended that I read Homegoing before any of the books on my wish list. Homegoing is a novel that tackles a big topic- slavery as it explores a family that is split by slavery where one sister is sold as a slave and ends up in the United States and the other sister stays in Ghana. It traces the experiences of the descendants of each sister in Ghana and in America. It’s a book I’m looking forward to reading based on the great reviews it has received. The Bookshop Book by Jen Campbell is a non-fiction book on my wish list. Jen Campbell is an author and booktuber. I watch her videos on books on YouTube from time to time and would love to read her work. The Bookshop Book is a book about bookshops around the world. As I love books, I would love to read the bookshops and how they have survived over the years. I also see it as a way of supporting Jen’s channel. My Name is Leon by Kit De Waal is about a young mixed-race boy whose white brother is adopted and Leon isn’t. Leon family is falling apart and the book explores their experience of social services and foster care. Leon’s experience on not being adopted is an important issue as sometimes white babies are preferred in adoption over black children. I think reading My Name is Leon would help me understand what it’s like to require social services. Most of the discussion I hear on social services are from documentaries on people depending on benefits and I want to listen to a different perspective from people who genuinely need the social support that the state provides. While compiling the list, I went on Book Depository to gauge whether my budget would be able to cover all the books. Hopefully, I’m able to get all the books on the list. Let me know in the comments what books are on your Christmas wish list. This entry was posted in African literature, Black British Literature, Books, Uncategorized on December 11, 2016 by Tunrayo. After graduating from university last year, I moved to London. Living and studying in a small city- Nottingham for three years didn’t prepare me for the London commute. I’ve been living here for a couple of months now and wanted to share a few things that help with moving around in London. Given that I don’t drive, public transport is my best friend. You can watch the video below to listen to my experience commuting within London and the sites that help me plan my journey and these sites could help you too. If you have any stories of travelling within London, share them in the comments section. I would love to read them. This entry was posted in Uncategorized on March 31, 2016 by Tunrayo. I was on YouTube about to watch a video, when a McDonald’s advert popped up on my screen. Usually, I click the skip the ad button but something on the advert made me stay to see what it was about. It was McDonald’s letting me know that the eggs in their McMuffins are real eggs. People had been questioning if the eggs were real and the company decided to respond to these queries. I have questioned the quality of their meat. Is it real meat or are they mashing different parts of a cow as meat for me? McDonald’s let me know that their eggs, chicken and beef are real so I don’t have to worry about the quality of their products when next I step into any of their outlets. The issue is I don’t know when next I will be stepping into McDonalds. I wasn’t enjoying the meals I bought from them so I stopped going. A while back, I went shopping on Oxford Street with my cousin and we decided to go to McDonalds’ because we were hungry. My cousin said she wasn’t getting a beef burger because since she started eating burgers from the “better burger” chains (I’m guessing the likes of Gourmet Burger Kitchen and Five Guys), she preferred their burgers to the ones from McDonald’s. 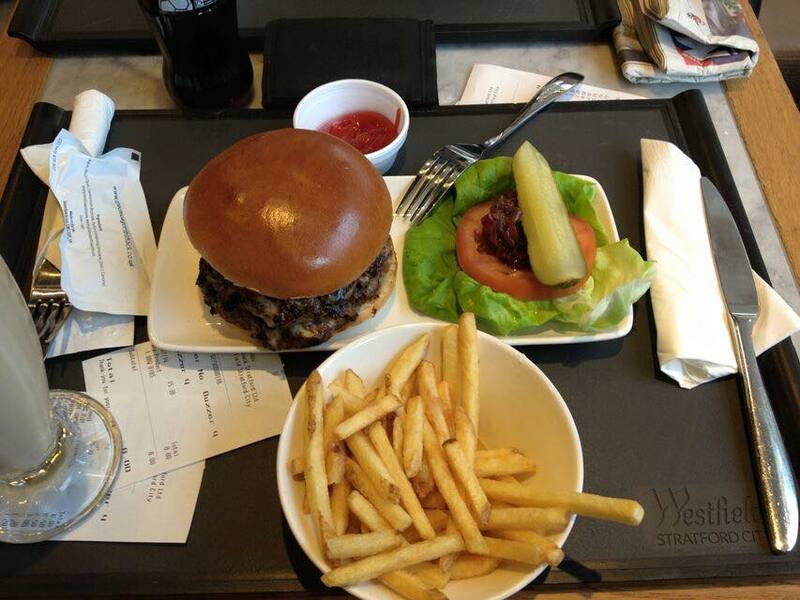 This was from a gourmet burger chain so a ‘posh’ burger. Now, McDonald’s have released a premium selection of burgers in some of their outlets in the UK to compete against gourmet burger chains such as Five Guys and Shake Shack. Will I be going back to McDonald’s to try their new premium burgers? I don’t know. Or will I be sticking with gourmet burger chains? This entry was posted in Uncategorized on January 30, 2016 by Tunrayo.